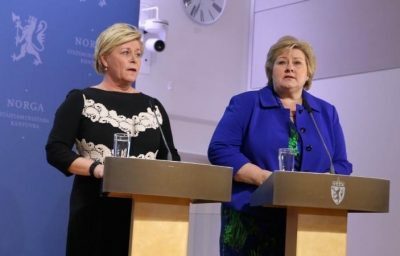 Prime Minister Erna Solberg and Finance Minister Siv Jensen, who have transferred more money from Norway’s Oil Fund to the state budget than any of their predecessors, now propose tying such withdrawals in the future to “more realistic,” and lower, expected returns. That can further limit the use of Norway’s oil revenues, and they also want to put more of the fund’s money into the stock market. Solberg and Jensen announced Thursday that their aim is ensure “sound and safe management” of Norway’s “large oil and gas riches.” The Oil Fund’s management has been a target of criticism in recent months, with some financial experts cautioning against investing too heavily in international stock markets and others worrying that the central bank (Norges Bank) has become too powerful in running what essentially amounts to Norwegians’ pension fund assets for years to come. The central bank, however, must answer to the finance minister (Jensen), and both she and Solberg are now making management proposals of their own. In addition to raising stock market investments from around 60- to 70 percent of the Oil Fund’s total assets, they also want to reduce the current rate of the Oil Fund’s average real expected returns from 4 percent to 3 percent. That’s the number that’s also been used since 2001 as the rule to determine how much of the fund’s money can actually be spent every year, also known as the handlingsregel. The government isn’t actually changing that rule that guides its finance policy, but proposes that use of oil revenues should follow the fund’s actual expected returns, which have declined. Solberg said that Norway has been “lucky” that it’s acquired so much oil wealth over the past 20 years since the Oil Fund was set up as a depository for the state’s direct oil revenues. It has grown to become one of the world’s largest sovereign wealth funds. Jensen said the proposal to boost stock investments was a result of a “collective evaluation of the advice we have received.” That advice has come from both the central bank itself, which is in charge of the Oil Fund through its NBIM division (Norges Bank Investment Management), and a government-appointed commission led by economist and professor Knut Anton Mork. Jensen said her finance ministry had also received input from others during a round of hearings. Knut N Kjær, for example, who served as the first chief of NBIM until Yngve Slyngstad took over in 2008, had recommended dropping investments in long-term commercial paper and putting more assets into cash. Newspaper Aftenposten reported earlier this month that Kjær, who built up the fund during its first 10 years, also thought that a proposal from NBIM and the central bank to boost stock investments to 75 percent was too risky as well. A majority on the state commission recommended 70 percent, even though its leader Mork favoured reducing the stock portion to just 50 percent. Jensen said the government now thinks that the risk of a 70 percent share stake is “acceptable,” noting that shares “have higher expected returns” than other financial instruments like debentures or commercial paper. Perhaps the most significant proposed change is the potential reduction of the generally accepted withdrawal rate from the fund, based on its actual returns, to augment the state budget. The 4 percent level that’s been in force was based on the fund’s average expected returns over time. Low interest rates, much lower oil prices and international economic and financial turbulence in recent years have lowered that expected return, and 3 percent is now viewed as more reasonable. The theory behind the withdrawal rule is that no more money should be taken out of the fund than it’s earning, even when it has earned very well. The size of the Oil Fund has soared in recent years, but the fall in oil prices has reduced that growth rate lately. It may seem politically ironic to some that Finance Minister Jensen, whose Progress Party has advocated using more (not less) Oil Fund money for years to invest at home as well as abroad, should now be the one to launch a proposal that could reduce its acceptable withdrawal rate. The sheer size of the fund, however, has meant that even though the Solberg-Jensen government has pulled more money out of the fund than any previous governments, their withdrawals have been well within the existing rule and even below the proposed 3 percent rule. Norway’s political leaders over the years have all generally restrained themselves from tapping into too much of the fund’s money, for fear of overheating the country’s economy. Initial response from opposition politicians was generally favourable. Snorre Valen, finance policy spokesman for the Socialist Left party (SV) agreed that it was “sensible” to lower expectations for returns on the Oil Fund. Both the Christian Democrats and the Liberals, which cooperate with the government in Parliament, had proposed changing the handlingsregel last summer. Newspaper Klassekampen reported last week that the Labour Party also was keen to propose a reduction in the rule based on lower expectations. Now, in an election year, the government has beat them to it.